Genius, Prodigy, Revelation, all are apt terms for this man. He singlehandedly changed the face (and sound) of modern Pop and R&B music. He brought funk to the mainstream, trailed motown everywhere he went, and gave us genius every step of the way. His is a voice that time will not forget and his words are those that the world will ever remember. Stevland Hardaway Morris (born May 13, 1950 as Stevland Hardaway Judkins), was a child prodigy, and he has become one of the most creative and loved musical performers of the late 20th century. Wonder signed with Motown's Tamla label at the age of eleven and continues to perform and record for Motown as of the early 2010s. He has been blind since shortly after birth. Among Wonder's works are singles such as "Superstition", "Sir Duke", "You Are the Sunshine of My Life" and "I Just Called to Say I Love You"; and albums such as Talking Book, Innervisions and Songs in the Key of Life. He has recorded more than thirty U.S. top ten hits and received twenty-two Grammy Awards, the most ever awarded to a male solo artist, and has sold over 100 million albums and singles, making him one of the top 60 best-selling music artists. Wonder is also noted for his work as an activist for political causes, including his 1980 campaign to make Martin Luther King, Jr.'s birthday a holiday in the United States. In 2009, Wonder was named a United Nations Messenger of Peace. In 2008, Billboard magazine released a list of the Hot 100 All-Time Top Artists to celebrate the US singles chart's fiftieth anniversary, with Wonder at number five. A prominent figure in popular music during the latter half of the 20th century, Wonder has recorded more than thirty U.S. top ten hits and won twenty-two Grammy Awards (the most ever won by a solo artist) as well as a Lifetime Achievement Award. He has also won an Academy Award for Best Song, and been inducted into both the Rock and Roll and Songwriters halls of fame. He has also been awarded the Polar Music Prize. American music magazine Rolling Stone named him the ninth greatest singer of all time. In June 2009 he became the fourth artist to receive the Montreal Jazz Festival Spirit Award. He has had ten U.S. number-one hits on the pop charts as well as 20 R&B number one hits, and has sold over 100 million records, 19.5 million of which are albums; he is one of the top 60 best-selling music artists with combined sales of singles and albums. Wonder has recorded several critically acclaimed albums and hit singles, and writes and produces songs for many of his label mates and outside artists as well. 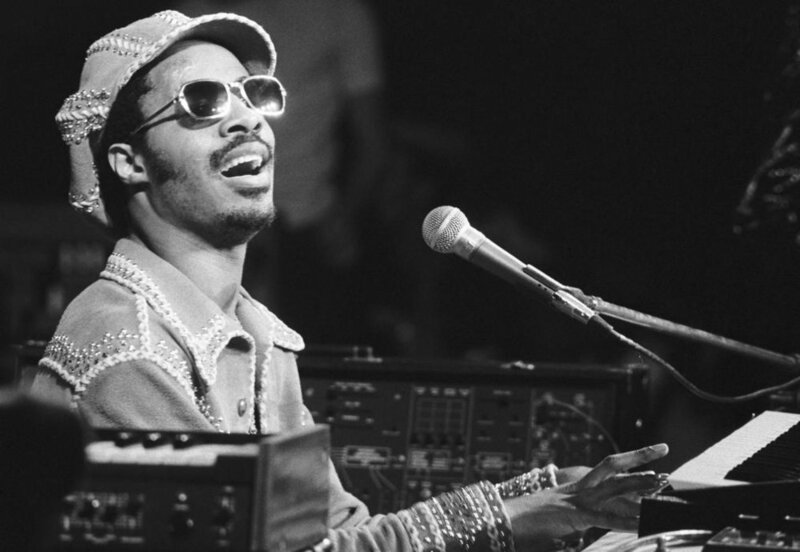 Wonder plays the piano, synthesizer, harmonica, congas, drums, bass guitar, bongos, organ, melodica, and clavinet. In his childhood, he was best known for his harmonica work, but today he is better known for his keyboard skills and vocal ability. Wonder was the first Motown artist and second African-American musician to win an Academy Award for Best Original Song, which he won for his 1984 hit single "I Just Called to Say I Love You" from the movie The Woman in Red. His classic 1970s albums were very influential on the music world: the 1983 Rolling Stone Record Guidesaid they "pioneered stylistic approaches that helped to determine the shape of pop music for the next decade"; Rolling Stone magazine's 2003 list of the 500 Greatest Albums of All Time included four of the five albums, with three in the top 90; and in 2005, Kanye West said of his own work, "I'm not trying to compete with what's out there now. I'm really trying to compete with Innervisions and Songs in the Key of Life. It sounds musically blasphemous to say something like that, but why not set that as your bar?" Even though I don’t much like Kanye, I applaud his sentiment here. He wants to compete with something greater than what is standard or adequate, he wants to be matched up with greatness, and though he may fail (and more oft than not does) he is still holding himself to a higher standard than most modern artists. So, today, with humble reverence and joy in my heart I choose Stevie Wonder’s “Overjoyed” as my, let your heart alight like the butterfly on its wing, watch your soul fly like the golden eagle in the sun, feel your energy blazing and buzzing around you like a swarm of hummingbirds song for a let yourself be caught in the flight of murmuration, feel yourself grounded to every other living thing, dare yourself to be better, brighter and stronger Friday. Ezra Furman - "Every Feeling"